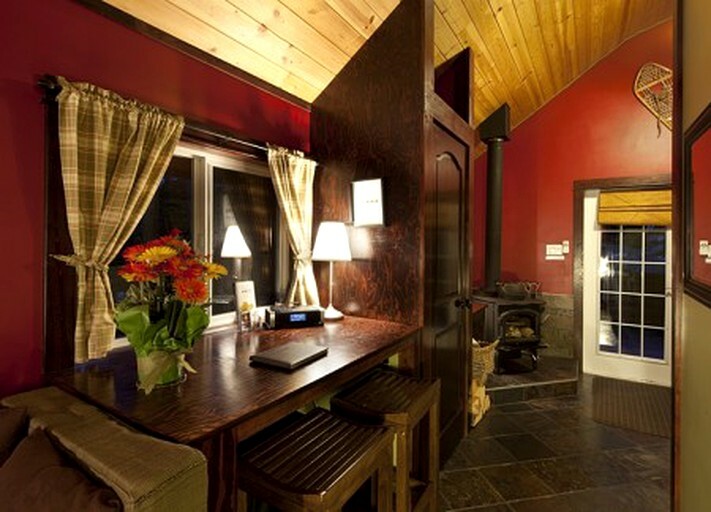 This rustic cabin is nestled in the woodlands of the Rocky Mountains in British Columbia. 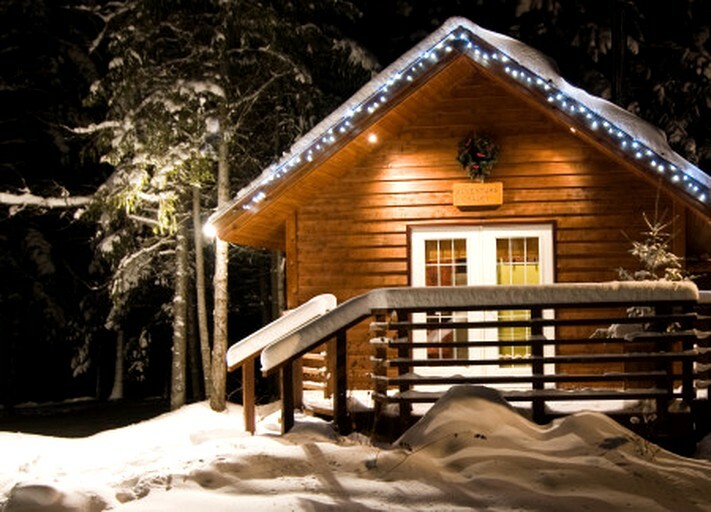 The wooden exterior, views of the forest, and luxurious furnishings make guests feel right at home in this cozy chalet. 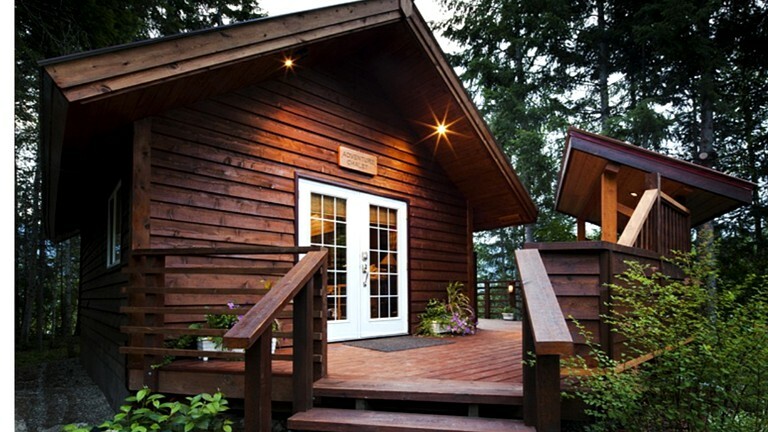 A one-bedroom, one-bathroom, getaway, this is the perfect woodland retreat. 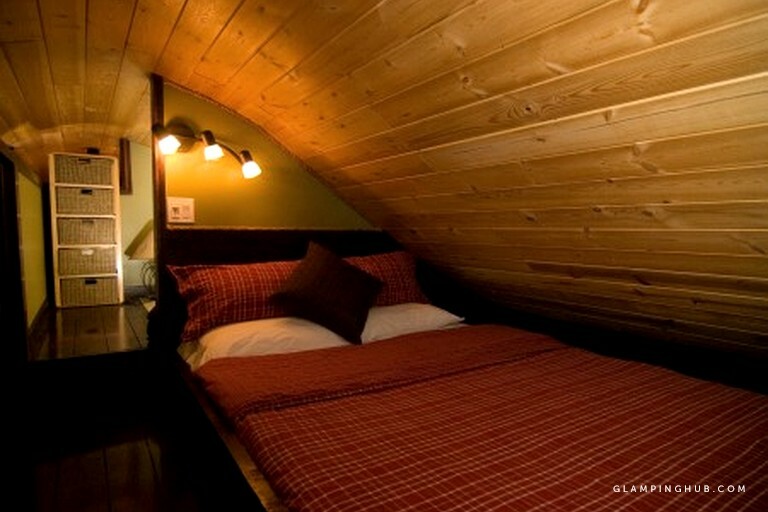 The bedroom features a queen-sized bed and is located in the loft, giving it a romantic, private feel. 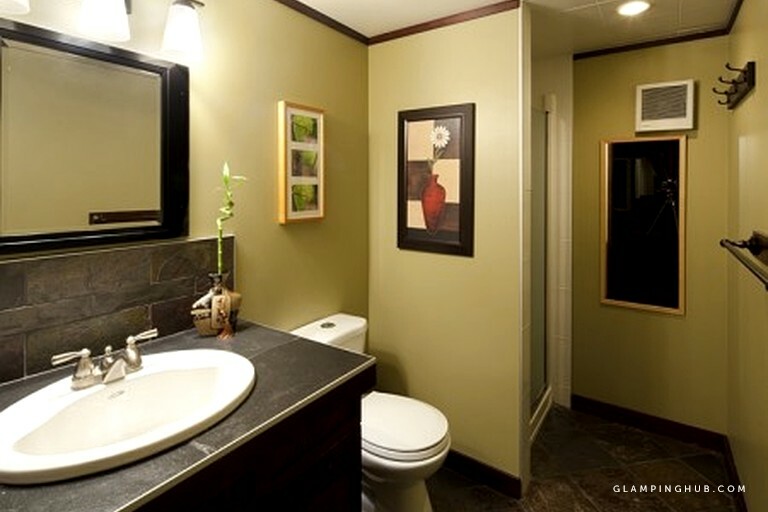 The luxurious full bathroom has a shower, vanity, and toilet. When guests want to unwind, the living area offers a flat-screen television, access to the loft bed, and a comfortable sofa that can be converted into a sofa bed if necessary. 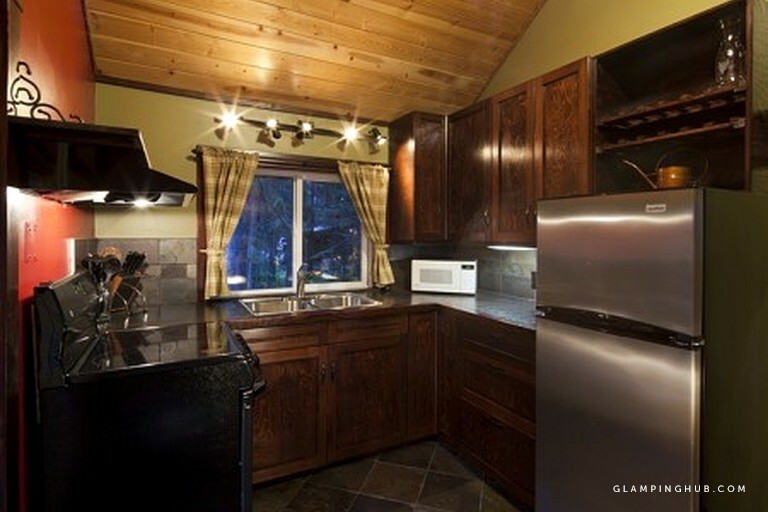 The fully-equipped kitchen awaits glampers wishing to cook and offers a rustic-modern feel with its dark, wooden cabinets combined with the modern appliances. Meals can be enjoyed at a gorgeous dining table with a nearby wood-burning stove or in the dining area on the private deck. Guests will feel right at home with all of the modern amenities available including cable or satellite television, a DVD player, a movie library, Wi-Fi, and an iPod docking station. 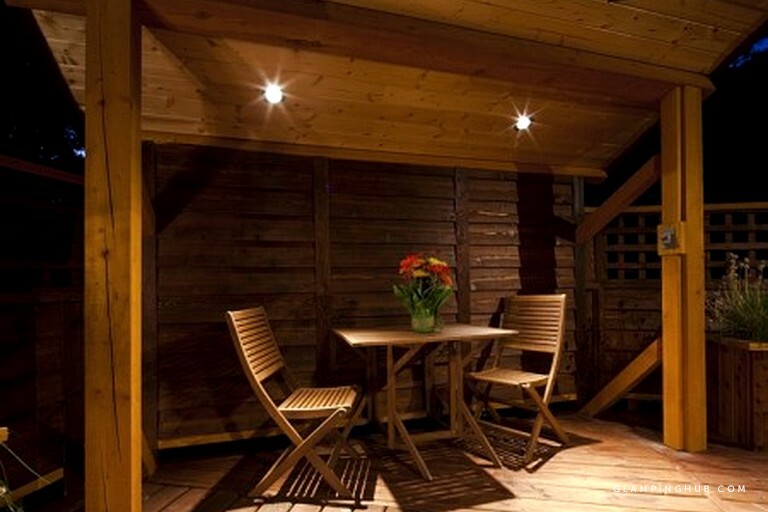 In the evenings, glampers will find themselves drawn to the private deck with hot tub and barbecue, the perfect place to relax and enjoy the company of friends and family. A communal fire pit is also accessible for all guests staying on the property, and a wedding platform is available on the grounds for those considering having their wedding on site. Weddings, family reunions, and other special events can be held at this beautiful mountainside retreat. Please inquire about group rates and pricing. 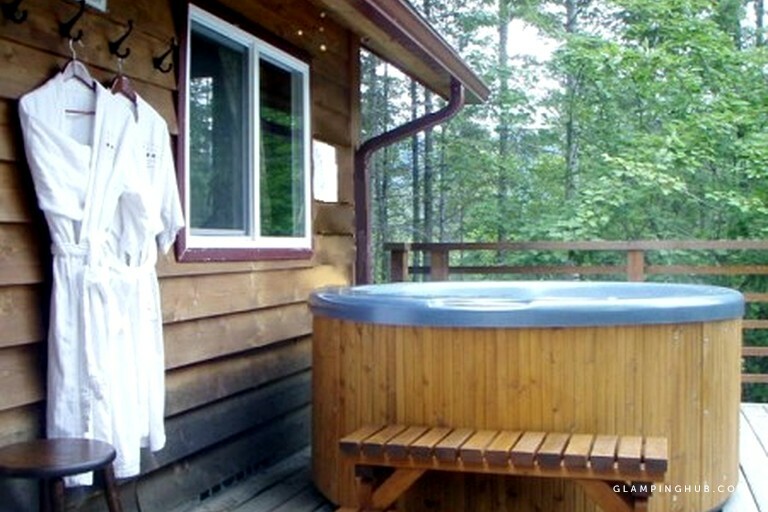 While visitors could easily spend all of their time on site, wandering the walking paths through the gardens, admiring the mountain views, exploring the miles of bike trails right out the front door, and soaking in the private hot tub, there are endless activities to take advantage of in this central location of British Columbia. 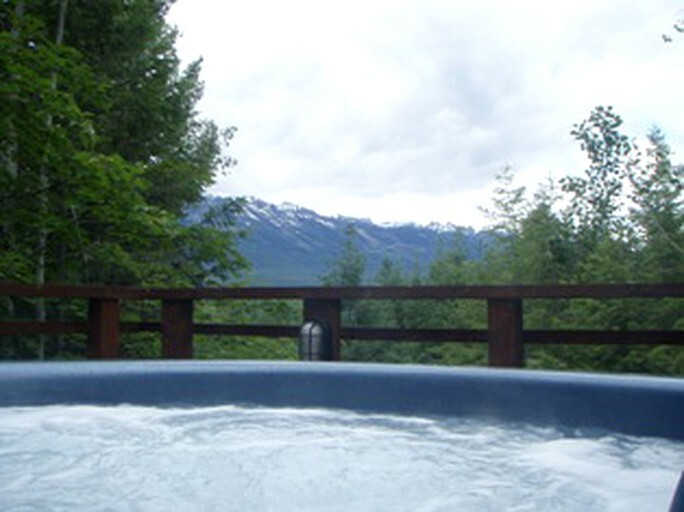 Nearby is the Kicking Horse Mountain Resort where guests can ski, hike, bike, and take a ride on the cable car for 360-degree views of beautiful mountainside and wildlife. 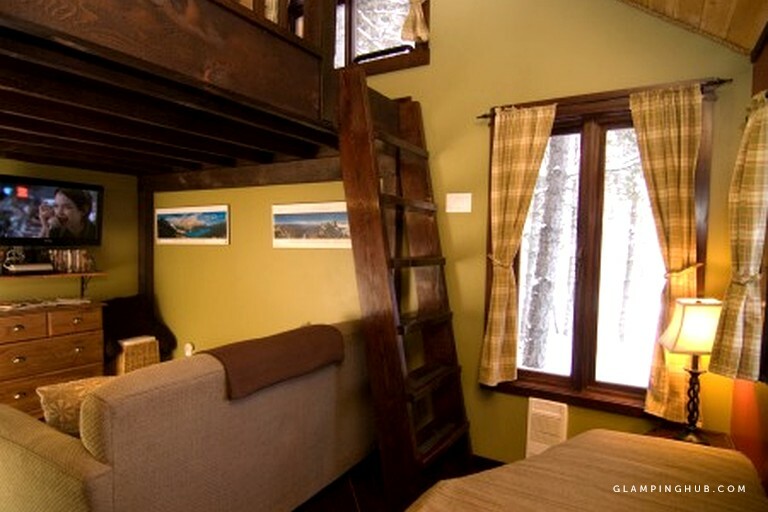 Glampers seeking adventure can spend an afternoon whitewater rafting on the Kicking Horse River, visiting the local Wolf Centre, hiking in Glacier National Park, or geocaching. The local town of Golden also offers a unique farmer's market with locally grown fruits and vegetables and handmade pottery, jewelry, soaps, and more. After a long day of exploring, guests can unwind and treat themselves to a delicious meal at the on-site, award-winning restaurant that is rated one of the top fine dining locations in Canada.